Here’s another frame project completed. 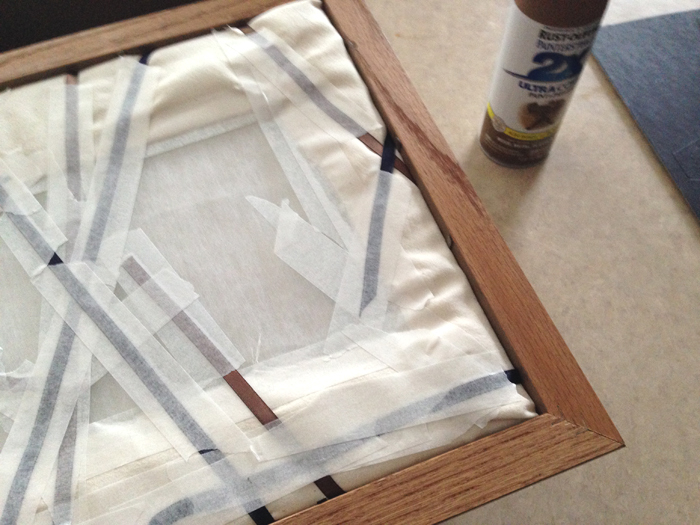 In November 2013 I talked about upcycling old unused photo frames here. Let’s face it. We get tired of our old stuff and want need changes in our home. It’s who we are. No sense in fighting it. We can have change for pennies rather than spending money on something someone else did. 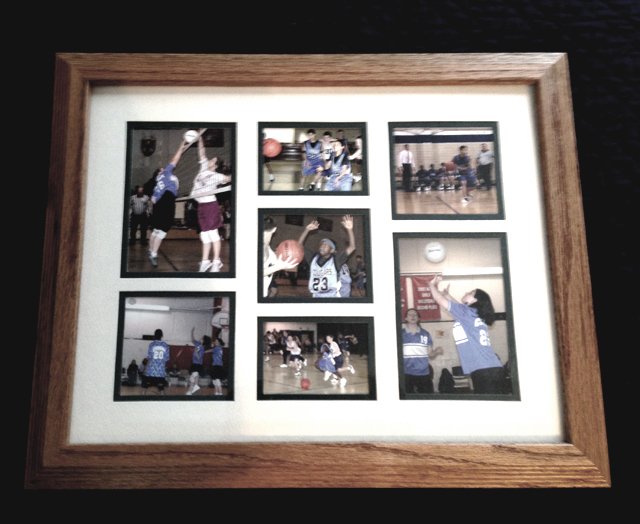 I searched through my boxes and found an old oak framed sports collage and painted it with a light tan spray paint. I didn’t sand it because I like the way the paint scatters somewhat and grain shows through just a bit. It will be hanging on the wall, so I’m not concerned about scratching or paint wearing off. Since I am in Wisconsin, I took it out in the garage, sprayed it with Satin Nutmeg Rust-Oleum Painter’s Touch Spray Paint and brought it in to my house to dry in a warm room. Well, I suppose “warm” is relative. I keep my house at about 60, so I guess some of you might not call that warm, but it’s warmer than 10 below! But just because, I’ll warn you to sand it so the paint adhears better. To each his own. I don’t mind doing things differently than others. I’m using Mountain Mist Quilt-Light Polyester Batting to puff it up a bit, but it’s not necessary. I’ve had it for a billion years, so I might as well use it. I rifled through my old fabrics in my quilt box and found some muslin – perfect for this project! 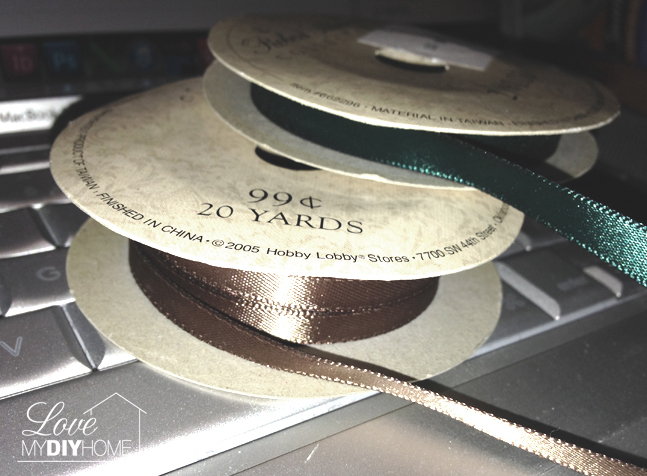 I found ribbon in my scrapbooking drawer. Of course I already had the spray paint, since I’m the spray paint Queen. So far this hasn’t cost me anything (well, other than the money spent years ago on the materials used on other projects). Old left over stuff doesn’t count, right? I ironed the muslin and doubled it. 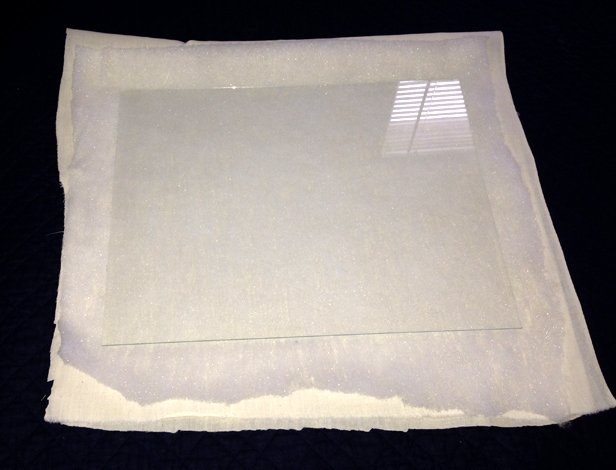 I used the glass from the picture frame as a template and cut the muslin along with my batting to about 2 inches larger than the glass. 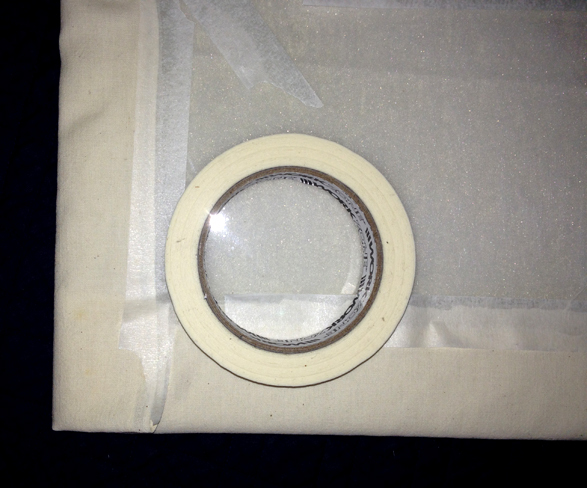 I taped it to excess on the back and wrapped the ribbon criss cross and taped that on the back as well. I decided to use navy and brown, but if you need perfect or uniformity, by all means use the same color in both directions. It’s not perfectly wrapped, but I didn’t intend on doing it perfectly. I’m trying to break out of my perfection box! I put the cardboard back on and it’s done! I not only have a new French Photo Board, but I’ve gotten another old unused photo frame out of my storage boxes. SCORE! Here are my other upcycled photo frame projects. 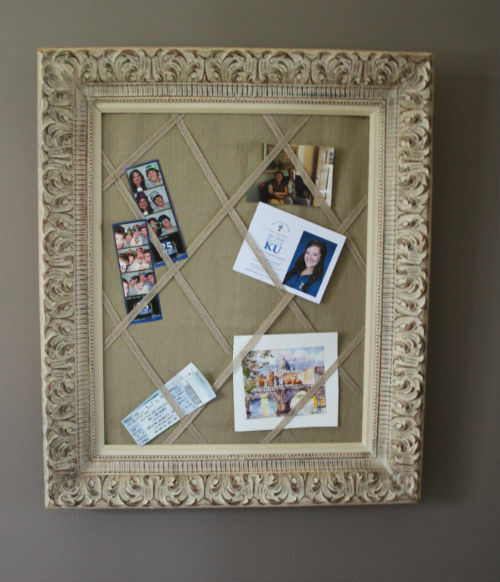 DIY Chunky Photo Frame – Re-purpose Old Picture Frames Part 3 DIY Framed Wire Tool Hanger – Re-purpose Old Picture Frames Part 2 10 DIY Projects to Upcycle Old Picture Frames + A FREE Printable! 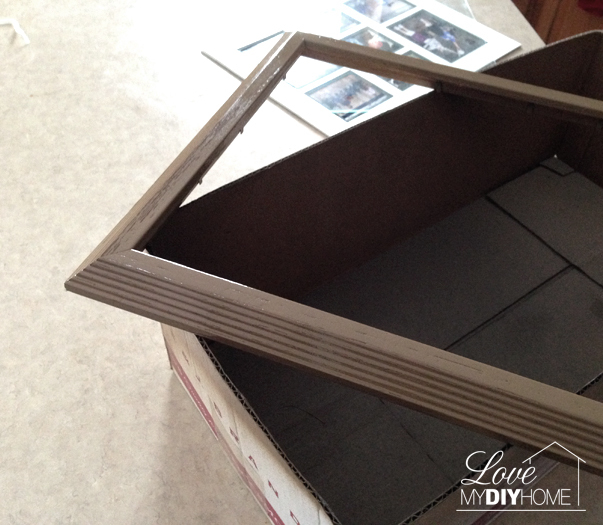 How to Upcycle an Antique Door – Part 2 Old Tissue Box Revived – Spray Paint Season is Here! From Trash to Treasure – Update old brass decor, don’t toss it! It looks very nice! I love getting use out of something old. Great job. I love repurposing older stuff and making something new out of it. Tamara, check out my post about combining frames into one chunky one: http://lovemydiyhome.com/diy-chunky-photo-frame-re-purpose-old-picture-frames-part-3/ . Very cute! What a great idea for repurposing older things! Love it, great idea! I have a ton of photos waiting to be on display. Great job on the frame. Tickles, thanks. It’s a way to do something different than just framing everything. I do love frames, but need to mix it up a bit. I am loving your site! I am new to trying my hand at DIY projects. Wish me luck. Trish – you honestly do need to give it a try. It’s so easy. Just pick something easy and give it a whirl. There’s nothing more fun than DIYing something that someone else would pay a bunch of money for – and you made it for pennies. 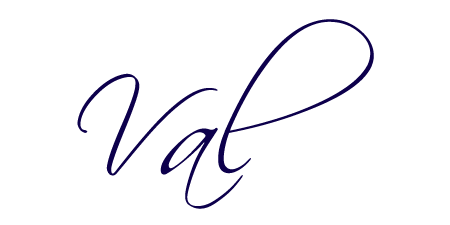 Your blog is fantastic. ! I really love the French Photo Board. I am going to rummage around my garage and see if I can find a frame so I can do this project. Thanks Tonya, if you do make one, I want to see a picture! It was so easy – much easier than I expected. I think people don’t realize how easy DIY can be. TerriAnn, thanks. You aren’t kidding about the spray paint – I need to buy stock in Rustoleum! I love repurposing! I also like updating a look that is a bit dated. We all have those multiphoto frames that could use some "love". Thank you for the idea. I just recently repurposed an old brown antique bonnet dresser. I painted the the whole dresser black and the drawers white. It looks adorable. I spray painted the ugly brass handles, silver. It looks brand new and very chic! What a great way to use up an old unsused photo frame! I'm sure I've got a box full of frames I need to go through and upcycle into something cute and crafty! Thanks for stopping by, Tonia. 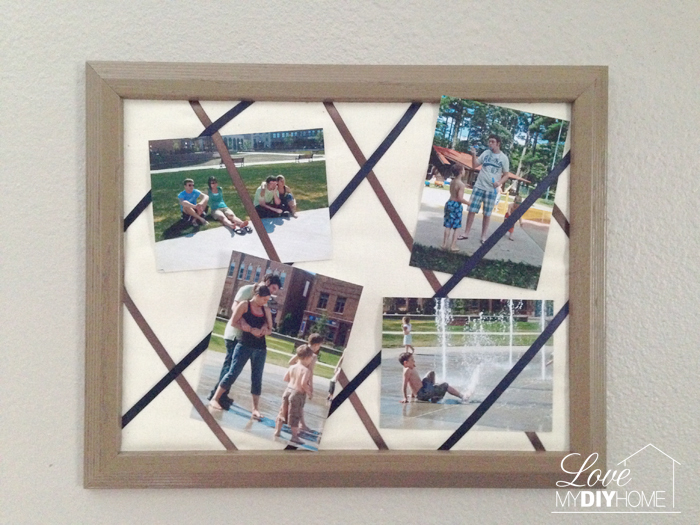 Here are some other upcycling ideas for old picture frames – http://lovemydiyhome.com/10-diy-projects-upcycle-old-picture-frames/. Love this!! So cute and a great idea. Thanks for linking up at Take it on Tuesday!